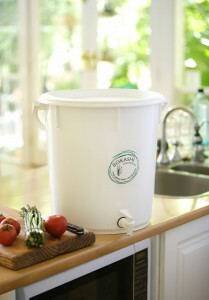 Our bokashi buckets come with all you need to start composting straight away. Our instruction booklet sets us apart from other companies. It is clearly written and comprehensive, including a trouble shooting section and contact details for those instruction-manually challenged! The bokashi process is simple and convenient, dealing effectively with the vast majority of food scraps generated in the kitchen, and requiring fewer trips to the garden to dispose of the end product. It is fantastic food for the garden plants, enriching the soil and fostering the proliferation of beneficial microbes within the soil. 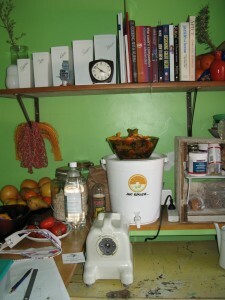 The bokashi bucket is on my kitchen bench. 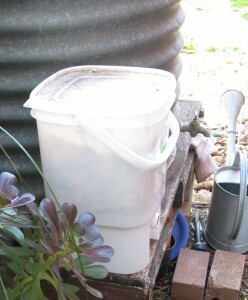 I use the Australian made bucket because it’s easier to get the lid on and off. I leave a bowl on top of my bucket to minimise the amount of times I open and close the bucket lid (longer fermentation time). I drop the scraps in when the bowl is full (as pictured!) and sprinkle a handful (only) of SA-made bokashi mix. I keep my second bokashi bucket outside my kitchen door. It so happens to be conveniently located next to the rainwater tank, so I just pour a little bokashi juice into the watering can, add water from the tank and fertilise my garden with an air of self congratulation! In winter I walk to the back of the yard when the second bucket’s ingredients has basically turned to mush, and empty into the compost bin. However, if it’s gardening weather I’ll just bury the bucket contents straight into the ground. I must say, in the past I have NEVER put the ingredients of my compost bin to use, as I didn’t really know what I was doing with it, and it took so long to break down anyway! 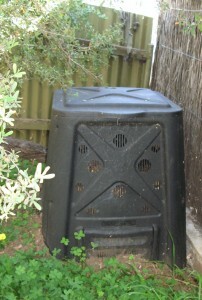 Now I confidently know that I will have compost at the base of my bin to shovel out when I want it.